Dinesh Mehta has been with the Colorado School of Mines since 2000, where he is currently Professor in the Department of Electrical Engineering and Computer Science. He received degrees (all in Computer Science) from the Indian Institute of Technology Bombay, the University of Minnesota and the University of Florida. 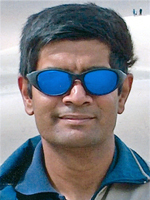 Before joining Mines in 2000, Dinesh was on the faculty of the University of Tennessee Space Institute, where he received the Vice President's Award for Teaching Excellence in 1997. He was a Visiting Professor at Intel's Strategic CAD Labs for several months in 1996 and 1997 and at the Tata Research Design and Development Center (in Pune, India) in 2007. He has also received graduate teaching awards at Mines in 2007, 2008 and 2009. Dinesh enjoys working with students and has advised or co-advised five PhD students and several Masters students. Dinesh's teaching and research interests and publications are in algorithms and data structures, which he has applied to problems arising in VLSI design automation, mobile computing, computational materials and cheminformatics. He has co-authored approximately 50 publications, many of which appear in IEEE and ACM journals. He is a co-author of the text Fundamentals of Data Structures in C++, co-editor of the 1400-page Handbook on Data Structures and Applications and the 1000-page Handbook of Algorithms for VLSI Physical Design Automation. Dr. Mehta serves as Associate Director of the ORwE (Operations Research with Engineering) PhD program, is a member of the Colorado School of Mines Faculty Senate and (honorary) Scientific Advisor to Milibo, Inc. He was Assistant Department Head from 2004-2008 and Interim Department Head from 2008-2010 in the former Department of Mathematical and Computer Sciences. He is a former Associate Editor of the IEEE Transactions on Circuits and Systems-I. At various points of time, Dinesh's non-academic activities have included hiking, playing chess, running 5K races, playing tennis, and coaching middle school MathCounts. Dinesh enjoys reading (his favorite authors are John Le Carré and, more recently, Dan Silva). He believes that a lot more should be done to expose children to Computer Science and related fields within Mathematics such as combinatorics, number theory and logic. If you agree, you may want to consider signing his petition at change.org.